At the time of writing this blog, we’re a mere 28 days away from one of the biggest events on the SUSE calendar – SUSECON. 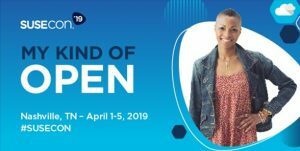 In April, thousands of IT decision makers, software engineers, developers, and many others from the open source community will descend upon Nashville, Tennessee. It’s not too late to register for SUSECON – there are still spaces available, and there’s some great sessions on the agenda. My particular area of interest is OpenStack (you may have noticed that I have a slight bias towards this if you’ve read some of my other blogs), and there are some fantastic sessions for attendees of all levels. If you’re looking to understand more about the SUSE OpenStack Cloud roadmap (Tuesday April 2nd at 5pm), then our product managers T.R. and Yaroslav will be walking you through our plans for the product. Maybe you’d like to understand more about the future of OpenStack, straight from the Chairman of the OpenStack Foundation, Alan Clark on Thursday April 4th at 2pm. Perhaps you want to learn some basic troubleshooting for SUSE OpenStack Cloud? Nicolas Bock and Keith Berger will be helping attendees understand how to troubleshoot the core OpenStack services (Glance, Cinder, Nova, Neutron, Swift and Keystone, aka the OpenStack Six Pack) at 4pm on Tuesday April 2nd. If you have completed the basic troubleshooting session and are hungry for more, there is an advanced troubleshooting session from Nicolas and Keith at 4pm on Wednesday April 3rd. Simon Briggs will be demonstrating the SUSE OpenStack Cloud upgrade process on Tuesday 2nd April at 11am, and there will even be chances to sit the SCA in SUSE OpenStack Cloud exam at various points during the week. There’s no need to get the blues by missing out on all of this great content and much more – simply turn them into greens by booking your place at SUSECON now! Nashville is known for many things, but as its nickname of “Music City” implies, it’s primarily music. This year, the music is going to take a slightly different turn as the official SUSE Band take the stage and play some of their greatest hits as well as some fresh new tunes, with some created especially for this event. Make sure you’re there to rock out with the band, and to eat some of Nashville’s famous hot chicken! If you’re still looking for reasons to attend, then there are even more to be found on the SUSECON website. Don’t miss out on what promises to be one of the hottest events in the open source calendar this year!